Nails biting is becoming a most common habit in most of us. it starts from childhood and stays with us adulthood too. in childhood, we think it’s not a big issue but its a very bad habit. 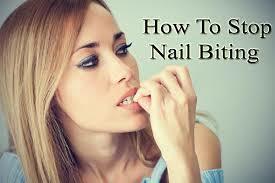 A recent analysis from dermatologists says that nail-biting will leads to tissue damage. by this growing of nails will stop. and also by bacteria and very harm full gems spread to your mouth from nail. We bite nails when we feel anxiety or stress then automatically hand moves towards mouth to bite it. so for every two weeks trim your nails short so that you are unable to bite it. I say this very good choice to get rid of it. Paint any anti-nail biting polish regularly by this you can stop biting nail. because it tastes very bad so that your conscious takeoff your hand from the mouth. trust me by this you never want to bite again. This fake nails just stickers stick it to your fingernails. they look very beautiful and stay very strong also. so choose this option also to get rid of it. Paint it with acrylic or gel nail polish it looks pretty and tastes worst so you cant bite it again. Most of the people bite nail when they feel anxiety so when you feel anxiety keep the hands busy by doing any work or playing with figures etc. Take coin with you and play with it to keep hands busy. Talk to anyone or sing a song which reliefs from your stress and anxiety. some other ways. carry chewing gum with you and chew it regularly and keep mouth busy. Byy following the above methods you can get rid of it. but while using nail art method becarefull you should not bite them because they are very harming full polishes. and when your suffering with this habit never use chemicals like acetone to wash your hands. Any queries regarding this article feel free to comment your query to get an answer by us.